I finally made homemade laundry detergent. It’s taken me forever to try it out ’cause I couldn’t find washing soda anywhere!! I was beginning to think it was just a legend! I was so excited when I finally found a local grocery store that carries it (Harris Teeter). Walmart didn’t have the Fels Naptha soap, but they had Zote, so I got that instead. I made the powdered laundry detergent recipe. It was really easy to make. I thought it would take forever for me to grate the soap, but it was so soft it shaved away in no time. I’ve been washing my clothes with the homemade detergent for over two weeks now. I have to say… it’s not my absolute favorite. It does feel good making your own product though. I kinda miss the “clean” smell of regular detergent. This kind doesn’t leave any scent at all, which is to be expected I guess. I’m sure if I used a scented dryer sheet that would help. Dishrags don’t lose that mucky smell after they’ve been washed. And anything you’ve washed them with will smell mucky too. Though Rebekah did leave a comment on my recipes post saying that the liquid recipe was good for getting that smell out. The kids clothes do not come very clean. Of course, my kids are outside wrangling chickens, chasing goats, and climbing trees. When they get dirty, they GET DIRTY! So, I stopped washing their clothes with the homemade stuff after the first two loads. I really like my ALL BABY detergent, with some Shout Gel on the tough spots. It does the job. With all that said, this detergent did work well for me and my husband’s everyday clothes. Stuff that didn’t need any major stain removal. I’ve been using this powder for our clothes and the bath towels, and the ALL detergent for other stuff. It is nice to know that if I’m ever in a pinch and need detergent, I can always make it with these ingredients I have on hand. Especially when money is tight! So, though it can’t be compared to name brand detergent, it will definitely be a keeper in my home. What do you think? Have you tried a homemade detergent yet? Do you like it? Do you have a better recipe that you could share with us? My family is uber allergic to Borax, so I haven’t tried making soap yet. Baking soda and washing soda aren’t the same, and just cooking it (BS) in the oven doesn’t change it’s chemical makeup. I have been using a homemade powdered laundry detergent for a few months now and am quite plesed with the results. My recipe called for fels Naphta soap, baking soad, washing soda, borax,and Oxy Clean. I also added some Purex crystals to give it a lavender scent. It is doing a good job cleaning and it does take the funky smell out of the dish cloths. For a fabric softener I use white vinegar with some lavender eesential oil. The white vinegar helps keep things soft when Ihang them on the line. Be aware, when you make your own detergent you use A LOT LESS than store bought because there are no fillers. I use 1-2 Tbl for a load of wash. Usually 1 but 2 if things are especially dirty. The problem with build up in the washing machine come from using too much, the amount you would use if it was store bought. I always swore by Tide for keeping my clothes clean but I am very pleased with the homemade. It is also much cheaper. i made my own powdered laundry soap just like you and my clothes didnt smell that great and they were not looking clean. so now i buy gain and mix it half and half with the homemade soap. i also still buy fabric softener and mix it half and half with vinegar. not the cheapest way to go but i feel it works so much better than homemade and a box of gain lasts my family months. I use 3 tablespoons per load in my he front load washer. I use vinegar scented with essential oil in place of fabric softner. For whites I add 2 tbsp of oxygen bleach. I never wash or rinse in cold as in the north cold is too cold. Unless your washer has a heater, hot is not hot enough to kill any bacteria. Warm water will allow fibers to relax and the detergent to do its job. I reached into my 5 gallon bucket with my measuring cup to scoop out some detergent with my large measuring cup to place into my old laundry detergent container and my hand started to burn a little. This has happened before and lead me to do some research. I no longer am using Fels Naptha as of yesterday. It contains petrochemicals. Not so good. I went to the Compare Foods grocery store (Hispanic grocery store) and the store had several (over 10) different types of laundry soap bars. There were several that were just as natural as Kirk Castille Soap! I purchased four to try out. Zote pink soap (14.1 oz. for $0.99), Viva (12.33 oz. and biodegradeable for $1.39), Lirio (14.1 oz. for $1.29) and Vel Rosita [12.25 oz. and contains an optical brightener agent (therefore non-chlorine bleach should not be needed) for $1.59. Kendra, I did read about how you no longer have a dryer. I used to have no dryer and use a wringer washer. Wish I still had the Maytag wringer and the James Handwasher. I do appreciate my current washing machine as it extracts much of the moisture and thereby cuts down on drying time…also, it uses less water and soap than a top loader. On the occassions when we use the dryer, we use dryer balls from a reputable company. They lessen the drying time and the wrinkles, without chemicals. We recently watched a series online called the victorian farm and they talked of using bluing…they how and the why. It was really interesting to learn about whitening white without bleach (which is toxic and rots fabric). starting at 4:35 That series was fascinating and sure helpd my appreciation for the life we now have. BTW, my family and I all appreciate your news/information on here. Made a Batch of the dry detergent today, liked the results. I used the Fels-Naptha bar soap.1 cup borax , 1 cup washing soda. Grated the Fels-Naptha by hand and then ran it through the coffee/spice grinder with good results! I also read on another site that you could microwave the bar soap for 90 seconds, you end up with a big “blob” of dry brittle soap that’s easier to turn into powder. I’ll try the microwave technique next time! Consider using Vinegar (about 1 cup) in the rinse cycle for you dishrags or any clothing that get musty or mildew. Works like a charm, if you find that the Vinegar smell is too strong after one rinse (I find one rinse fine.) You could always rinse again. I also agree wholeheartedly with washing the dishrags in hot water. For clothing that becomes gray, yellowish over time try Mrs Stwerts bluing you need very little (a few drops) and it is non-toxic and biodegradable. In Victorian times women used “bleaching fields” if you way your whites out on the lawn on a nice day grass has a bleaching and whitening effect on cotton. Thank you Josie 🙂 I always use white vinegar in my rinse cycle… especially for baby diapers! It’s great for getting odors out, and also softening clothes when line dried! I have been using the liquid, made with Fels Naptha, for over a year in my HE machine and I love it!! We are a family of 8, with all age ranges for children, and 5 of them are male. I tried Tide HE for a little while last month just to compare again. My son didn’t change the load to the dryer for a day, he was getting used to having this conveince with the homemade soap. When he brought the dry load up to be sorted…P.U.!!! I rewashed it with the homemade soap and it took the smell out. Lesson #1 learned- Store boughts don’t always kill all of the smell causing bacteria on your clothes, but apparently the homemade soap does a better job of it. I think that I may have thought that the store bought always did a good job because the smell that was in the soap made me think that it was clean. Lesson #2 learned- Warm water works best with the dirtiest items. Lesson #3 learned- Don’t try using the cool water with the powdered. It doesn’t combine with cool water as well. Lesson #4 learned- Vinegar definitely is a great rinse aid and doesn’t leave your laundry smelling like a salad! LOL! I use a recipe that I found at razorfamilyfarms.com for HE machines. Hi1 I have used homemade laundry detergernt on and off for the past seven or eight years. I find it works great for me! I had kids play sports and it cleaned their practice clothes and got the smell out! Just add a cup of arm and hammer baking soda along with the other ingr. I make sure to use hot water for my whites, this will cut down on the dinginess. My grandma always hung out her laundry, she said this cuts down on dinginess too. She was right! Dawn dish detergent gets out greasy stains. Also always soak really bad stains before washing them. My son went to boyscout camp in New Mexico and the stains were so bad even tide couldn’t get them out. Also make sure to use white vineger once a month to clean your machine. I just started making liquid soap. I have been making my own CP soaps for about 5 yrs now. So I have plenty of soap. Naturally I used my own soap to make the liquid soap. I am one of those people that can never follow a recipe exactly because I always change it. Instead of using one bar of soap I used two pounds of soap, double up on my borax and washing soda. I made 5 gallons of liquid soap the first time. The first thing I washed was the dish towels and dish rags. Figured those are items I can stand to lose. My reaction, OMG! the towels are very clean. Second OMG! the cloths were very soft, as if I had used fabric softener. I was impressed with how clean my clothes have turned out. I also used Lemongrass essential oil in my laundry soap not only for the fragrance but Lemongrass EO is a natural anti bacterial, anti fungal and anti viral ingredient. It is also an effective insect repellent, mosquitos and flies hate the smell. The strong, sweet scent of the oil has both the ability to also calm and the ability to revitalize those who smell it. Its citrus aroma also has a cleansing effect, helping you not only wash away the cares of the day but also helps to wash and clean your clothes as well. I love the lemony citrus aroma of Lemongrass. FYI I am still tweaking my recipe. I did share the laundry soap with my neighbors and they too had an OMG experience. FYI I am still tweaking my recipe. I did share the laundry soap with my neighbors and they too had and OMG experience. I have made the detergent with borax, washing soda, and zote soap. I like ivory soap really well, but the zote soap tends to make my towels softer. I do add a bit of oxy wash (dollar general brand – $5 bucks for a HUGE tub!). When I wash whites, I add extra detergent (just like I did when I used gain!) for the tough stains, and I use bleach and the dollar general brand spray and wash (I just spray mine into the water as it fills up…). I love it, and my clothes do smell fresh and clean, not perfume-y(!). I don’t think I’ll ever go back to buying it ready made. I use the dry homemade laundry detergent, and I like it. It doesn’t clean quite as well, but any heavy stains I pretreat with felsnaptha. I agree with missing the store detergent smell, but since I have started drying all my clothes on the line, they all smell like sunshine anyway. One other thing, I don’t know if anyone mentioned. For fabric softener use white vinegar. It really softens and helps with the mildew towel smell. I’ve been making my own detergent now, the liquid recipe, for about six months now. As for the scents, as others have mentioned, you might want to consider adding essential oils to the mix. I haven’t yet tried them yet, but I found a lot of clean scents from Peak Candle Supplies, including Downy Fresh. The one I mentioned says it’s safe for body products, so you might want to give that a shot. In regard to the stains: I was horrified when my daughter (who knows to empty her pockets before the shorts hit the laundry basket) left a pen AND a highlighter in her pocket and they got washed AND dried. Once I found the mess on a good 50% of my clothes I wet them and rubbed some of the laundry soap (Zote or Fels Naptha) on the spots, waited 20 minutes, let them soak overnight, then washed again normally. Behold, stubborn pen stains were gone from EVERYTHING. I just recently made my first batch of laundry soap. I say just recently, I mean 3 months. It sure does last a long time. Very good for the budget. Thanks. I had the same problem with musty-smelling clothes that got gradually dingier and dingier. Don’t think I’ll make it again. Sam’s Windfresh is almost as cheap anyway and does a better job in my opinion. I always use white vinegar in the rinse with my homemade detergent. I used to make the liquid “snot” but then got a HE washer and couldn’t use it anymore. I have searched and searched but cannot find a recipe that can go in an HE machine!! ARG! I’ve been making homemade laundry soap for about 10 years. Your first results were very similar to mine so I started messing with the recipe a bit. Here is what I’ve found. First, I think Fels Naptha gives a MUCH better result. I also keep an extra bar of it and use it to pretreat bad kiddo stains. I just get it wet and glide it over the stain before it goes in the washer. Secondly, I always add 2 small boxes of baking soda. I find it helps to give a more “clean” smell and also helps with the stains. Lastly, I always use white vinegar in my rinse cycle. It works far better than any fabric softner I have ever used. I use this recipe for both our regular laundry and our diapers and am happy with the results. I hope this helps you. PS- I LOVE reading your blog, it has been a blessing to me. Have you tried adding a couple of drop of essential oil to the wash? I know tea tree oil is supposed to help get funky smells out. I would guess 4-6 drops would be plenty to get the mildew smell of kitchen towels out. As for the smell of regular detergent, I guess it depends what scents you like. Some of the smells would probably be harder to duplicate though. I like Michele’s suggestion of adding a scop of regular detergent to the mix. A box would last forever AND you would get your fave laundry soap scent. I MADE THE HOMEMADE LIQUID FOR AWHILE A FEW YEARS AGO, MY SON USED TO RIDE DIRTBIKES AND SO WE HAD A LOT OF RED CLAY STAINS IN HIS CLOTHES. THE HOMEMADE LIQUID WAS AMAZING AT GETTING THE STAINS OUT, IT CLEANED BETTER THAN ANYTHING I HAD BOUGHT, BUT OVER TIME IT SEEMED TO ME THAT OUR WHITE CLOTHES STARTED TO LOSE TH WHITENESS. THEY LOOKED DINGY. I WASNT SURE IF I WAS JUST IMAGINING IT, UNTIL I LOOKED UP ON THE INTERNET SITE, AND SOMEONE SAID IT WAS THE OPTICAL BRIGHTNERS THAT WERE NOT ON OUR CLOTHES ANYMORE. STOREBOUGHT DETERGENT HAS CHEMICALS THAT MAKE YOUR CLOTHES APPEAR CLEAN AND BRIGHT. WELL, I DECIDED CHEMICAL OR NOT, I DONT WANT GRAY DINGY CLOTHES, SO I WENT BACK TO BUYING IT AGAIN. I MADE THE DRY DETERGENT ALSO, BUT DID NOT LIKE IT. I HAD BEST RESULTS WITH THE LIQUID, AND INSTEAD OF ZOTE AR FELS NAPTHA (I TRIED BOTH) I GOT BETTER CLEANING RESULTS WITH A BAR OF GRATED IVORY SOAP. IF THE CLOTHES WOULDENT GET DINGY I WOULD MAKE IT SOME MORE. 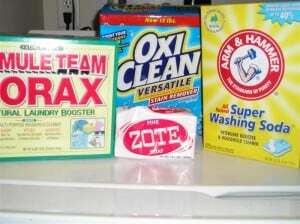 As you read in my blog, I tried the liquid detergent,and so far,we love the results. I do add OxyClean after I pour in the detergent,but that’s because I put OxyClean in my laundry,no matter what detergent I use. When I first used the detergent,I thought I detected a slight lemony scent from the Fels Naptha,but it must have been my imagination. There is no scent at all. I have always used dryer sheets,so I just continue using them. I have converted a few people that I have shared the detergent with,and have passed your receipe onto them. So far, I have only had postive feedback. My brother in law informed me that it actually helps soften liquid nail residue on clothes,so it can be scraped off! He says no other detergent has ever done that…if got on your clothes,it was there for life. That’s a pretty good testimony! I have been using homemade laundry soap for over a year now, but I use the liquid recipe. It works well on everyday laundry. When I have a load with my husband’s soiled work socks or washcloths with makeup stains, I add some Seventh Generation chlorine free bleach and that works great. If you want a scent, you can add some drops of an essential oil. We have allergies, so I love the fact that there is no scent. Have you tried switching out your fabric softener for white vinegar? That works well, too. Again, it leaves no scent, which I like. I have never tried making my own detergent. We use Charlie’s Soap for everything and love it. Everything comes out clean and the diapers come out sparkling. There is no smell, but we are sensitive to fragrances anyway, so it is fine by me. Some people don’t like Charlie’s Soap, but we have never had any issues. I guess it may be a water issue? Have you thought of trying soap nuts? I’ve made both the powder and the liquid version of homemade detergent. The powder is much easier and quicker to make. I’m a scent girl. I love GAIN original detergent. I decided that when I make the power or the liquid homemade version, I’ll just put in a scoop of the GAIN powder. Yes I’d be spending money on a name brand detergent, but if I only use one scoup for the entire recipe of homemade, it wouldn’t increase the cost too significantly and I’d be happy with the nice smell. I haven’t made the homemade in a very long time — I’ve been buying the boxes of GAIN. But I have only been using a very small amount of the GAIN per load…..even tryin to teach hubby to cut back. and ended up with almost exactly the same results! my kiddo’s uniform shirts and socks are the issues with mine. Even with adding more of it, they just don’t get clean…. even when it’s just mostly spilled food on hers. and if the towels sat wet in the bathroom, they kinda smell right out of the dryer for a while. but it does work ok on laundry that doesnt really have stains, just has been worn. so i got store bought soap for the whites…. because i was using a ton of stain stuff on them costing more than the soap anyway. i’m just about out of my first batch… and really seriously considered giving up on it entirely. but think i’m going to make another round, just because i already have everything but another bar of soap. I’ve pretty much decided not to bother with homemade detergent. I priced out the ingredients at one point, and it cost about the same as a box of our favorite detergent (Arm & Hammer dye and perfume free powder – we can’t do anything perfume-y other than true line-dried freshness). We never ever use a full cup/measurement though – so no residue to deal with regardless. I can watch sales and stock up with coupons on this stuff anywho. Luckily I’d stocked up on detergent a few months before we got laid off, so it was just another thing we didn’t have to worry about going and buying since when I stock up, I stock up. I did try some Charlie’s Soap (add a .com and you’ll find ’em) after hearing various rave reviews on a cloth diapering forum years ago. It was awful. My hard/mineral-laden water struck again. Took 2 months of washing and washing every. single. thing. over and over again to get the funk out. Sheets, towels, clothes, diapers, you name it. Only fabulous way of truly stripping them was to leave them on the clothesline as a rainstorm moved in. I make the liquid soap and love it. I don’t like the smells in regular laundry soap as it gives me a headache. I still use a spot treater on heavy mud or tomato stains, but that is because I have it on hand. I have also used some of the homemade liquid detergent to pre-treat the spots and let it sit, it works well, too. Peroxide is great at getting out grass stains. Rubbing alcohol will get out mud and vinegar is a good stain treater, too. The key is to treat your stains early. When the children are done with their clothes for that day, treat any spots and toss into your laundry basket. It helps keep the stains from setting and they will come out in the wash much easier. As far as dish rags smelling, I’ve never had a problem, but I wash them in hot water and bleach. If you don’t want to use bleach, you should still wash them in hot water. The hot water will kill the germs and will also get any whites whiter…always wash your whites in hot water (my family has owned a laundry and dry cleaners for years).